Thank you for visiting our new Internet site. We want to give you the opportunity to stay in touch with our church, our congregation, and events. A new content management system will enable us to always keep you up to date. At present, this web site can offer you information about who we are, what we believe, share a video, and give you directions to our church. Upcoming events will be posted, and you may sign our guest book. You may also email us your comments and questions. You can reach us at (417)239-3330, or by email mbcog@centurytel.net. Our mailing address is P.O.Box 31, Kirbyville, Mo. 65679. We are looking forward to hearing from you. We will be more than happy to help you. Directions to our church: From downtown Branson, Mo., take the Forsyth exit from the round-about, going up a hill on highway 76 east. Look for the Candlestick Road street on the left at top of hill. Turn left onto Candlestick Road, then make a sharp right turn onto Carter Road. 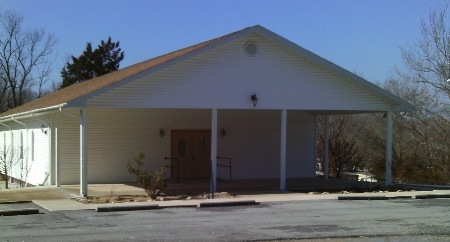 Chruch is located at top of small hill, 199 Carter Road. From Hollister, Mo., take the Forsyth exit at the round-about, and follow above directions.